Every New Jerseyan down in Sea Girt liked the holidays a lot, but one curmudgeonly squirrel did not. “It tells me they definitely wanted to do it and they want to accomplish their goal of making sure the lights don't work,” an officer told NBC 4 New York early on in the investigation. The lights were rapidly repaired and replaced so the ceremony could go on as planned last Friday, and police kept a close eye on the lights. 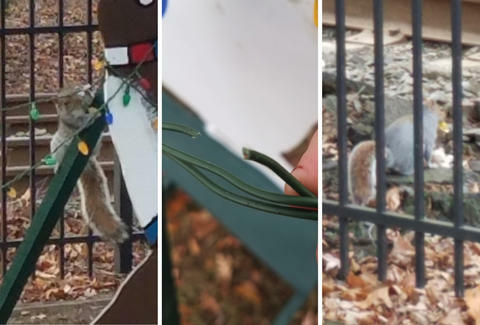 But on Saturday morning, the day after the tree-lighting ceremony, a passerby cracked the case wide open, snapping a few pictures of a squirrel chewing on the wires. As to the rodent's motivations, it presumably hates Christmas. But if we're to believe Dr. Seuss, it could also be that squirrels have really, really small hearts. "The squirrel was' charged 'with criminal mischief & released on bail," the police department said in a press release posted on social media (shown above). The truth, however, is this dastardly squirrel remains at large. In the meantime, the police will keep the display under surveillance to ensure the Christmas spirit stays intact. No one seems to have considered including the squirrel in the celebrations and teaching it the true meaning of Christmas, but there's still a whole month to go: Its heart might grow two sizes yet. James Chrisman is a News Writer at Thrillist who kind of gets where the squirrel was coming from. Send news tips to news@thrillist.com and follow him on Twitter @james_chrisman2.